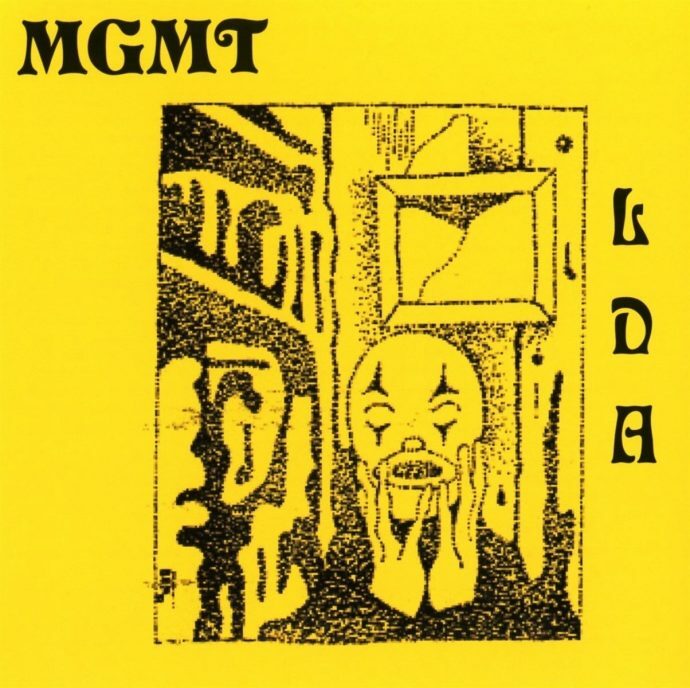 The interim between the newly released Little Dark Age, and MGMT’s self-titled album (released 2013) was hardly even filled with radio static. The band had seemingly disappeared off the face of the Earth on social media, leaving fans wondering whether there would be another album. Somewhere within the static fuzz of mid-2016, the band revealed that they were working in a home studio. This album was largely self-produced, with the help of Dave Fridmann and Patrick Wimberly, although there are various other artists featured. Ariel Pink, Connan Mockasin, and several other musicians played on some of the tracks, adding their particular brand of psychedelic sound to the 80s-inspired record. Goldwasser’s use of electronic sequencers and synthesizers gave the album a distinct new-wave vibe, often directly referencing specific artists. In the most recently released single, “Me and Michael,” the band parody’s the concept of stealing a song from another artist, ironically, sounding a lot like New Order and Depeche Mode all rolled into one. While remaining an appropriation band, MGMT is able to create original content. While exercising irony, they still create genuine emotional soundscapes. They’re silly, while remaining intellectual, never taking themselves or anyone else too seriously. These catchy, radio-friendly singles lull listeners into a state of false comfort and humor, as the album progresses from here, it becomes more complicated, never truly straying too far from the new-wave aesthetic they had built throughout. Much of the message of the lyrics have to do with the positives and downfalls of new technology. “Tslamp,” for example is written about “time spent staring at [one’s] phone,” and the search for connection in this increasingly ‘connected’ world. Van Wyngarden writes, “You should come with me, // We can lose ourselves in nothing, // Happy faces from the feed // and we try to turn them into something, // even if you choose to believe that it’s empty.” Though several of the songs on the album have incorporated ironic, humorous lyrics, these seem more somber and honest. In true art rock tradition, MGMT borrows the aesthetic from Pink Floyd’s “Brain Damage” for its second to last track. The song builds from simplified acoustic guitar and filtered synths. Van Wyngarden uses the lower register of his voice, which apart from this album is generally unusual for him. The lyrics sound like they’re straight out of Alice and Wonderland, “When Your Small” utilizes the basic rhythmic pattern, and raises it with Carroll-style rhyme scheme, simultaneously feigning depth while spouting nonsense like the March Hare.